Busi Renkin can be described as a prime example of a typical shounen anime that aims to engage and captivate the average male teen anime watcher. It is quite overly dramatic, typical, and contains loads of action that a shounen anime should have. The story begins when high school student Kazuki Muto is killed one night saving a mysterious girl from a monster, only to wake up in his school dorm, believing it to have been a dream. However, he soon finds out that dream wasn't a dream at all when a giant serpentine monster attacks him and his sister. Tokiko Tsumura, the girl he saved, explains that the monster is a homunculus. Kazuki had been attacked and killed by it when he was rescuing her. However, she, feeling responsible for him, revived him by placing a Kakugane medallion in his chest, serving as a replacement heart. The Kakugane, as Tokiko explains, is an alchemical device that, when activated, takes a certain form based on the Kakugane's user, forming a unique Buso Renkin. The Buso Renkin is the only thing that can destroy a homunculus monster. Using this, Kazuki creates his own Buso Renkin (the "Sunlight Heart", a huge lance). Along with Tokiko and her own Buso Renkin (the "Valkyrie Skirt", an execution scythe), Kazuki joins the fight against the homunculi and their master. I can not think of any way to describe how stereotypical and generic this anime as a shounen anime. The story for one, is completely overly dramatic and fictitious to the very core. The anime rather successfully presents a story full of made-up stuff that seems to make sense at second glance. The story starts off with your average guy which happens to be killed by a monster whilst trying to save a girl he stumbles across one night in an abandoned factory. Of course, he gets saved by the girl when she inserts an alchemy device called a Buso Renkin into his heart. And so, they form a team to defeat the monsters referred to as the Homunculus to stop them from destroying the city. You might think already that that storyline is quite generic and has been reused before. The story definitely shows the typical "zero to hero whilst keeping a secret from everyone" scenario that most shounen action fantasy anime has. Whether you enjoy these type of anime will determine if you found the story enjoyable to watch or not. Of course though there a few comic relief moments to liven things up a little when all the stress from the constant battles has built up. Ultimately, the anime is quite cheesy in some parts, and unrealistic like a child's imagination is others. The art was pretty average with some nice details in backgrounds and sceneries. The character however, lacked detail and were quite generic indeed. The quirkiness of the collection of the characters made them felt oddly out of place in the anime and resultedly didn't really appeal to me very much. Other than that, the animation was quite fluid and smooth. I noticed however that some battle animations seemed to have been reused a few times and that may impact viewing experience for many. Voice acting was average. Some characters had appropriate voice acting whilst others just felt out of place. Theme songs were rather typical of a shounen anime and some background music seemed a bit inappropriate to the context at times. I noticed that some sound effects were unrealistic presented in some situations and so you are able to pick up these minor annoyances. The characters were rubbish in this anime.They were really poorly presented and extremely generic. Take Kazuki Muto for example; teenage boy, spiky brown hair, relatively tall. I can think of a few other anime that has the same description as Muto does. Tokiko was rather average as well. Heroine of the anime with short hair and a slight tsundere attitude. What's with the scar on her face? The anime doesn't explain so we have to assume that she got it from some battle before. The other characters are not really worth mentioning here although you do get a evil old man, a gay rival, a fat guy, the class nerd and a peppy girl. This pretty much is the collection of heavy stereotypical representations of characters in anime. Overall, disregarding the rather childish storyline and generic characters, the action was quite enjoyable to watch. Ultimately, it boils down to whether you are into these type of anime or not. For me, the action was fun to watch but the story and characters was slightly disappointing. 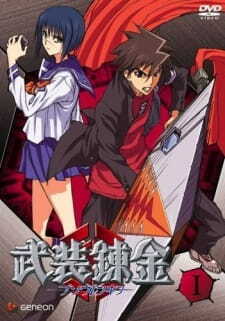 If you have the time, Buso Renkin might be worth watching. Everything is pretty unrealistic and made-up like a child's imagination. The impossible happens and randomness is pretty much abundant. Characters were generic and looked boring. Some nice detail in backgrounds and scenery. Voice acting was hit and miss. Sound effects were rather fake. Some poor choice in music for some scenes. Generic! Boring! Lacked depth and background information for most characters. The battles were enjoyable to watch although some parts seemed to have been reused. Definitely your typical shounen action anime. Nothing really special or extravagant here.